With recent advances in technology, plus increasingly affordable gear, the transition to capturing and outputting content at 4K and higher resolutions has happened fast—the need for faster than Gigabit Ethernet speeds to transfer all that data has accelerated equally fast. For post-production shared storage workgroups and other bandwidth-intensive workflows, 10Gb Ethernet is the new data transfer standard. Speeding its adoption, very affordable 10Gb Ethernet switches with RJ45 (copper) have significantly reduced the cost of setting up 10GbE infrastructure, but the price of adding client connectivity has remained a barrier for some. Now, there is an equally affordable 10Gb Ethernet interface for your desktop and workstation computers—Sonnet’s Solo10G™ PCIe Card, a powerfully simple solution for adding blazing-fast 10GBASE-T 10GbE network connectivity to Mac, Windows, and Linux computers at a price that’s sure to please. The Solo 10G PCIe Card is equipped with a single RJ45 socket, enabling you to connect your computer to 10GbE infrastructure via inexpensive CAT 6 cabling at distances up to 55 meters, or CAT 6A cabling at up to 100 meters. Does your facility have CAT 5e wiring installed already? You can still get a great performance gain—up to 500 percent over Gigabit Ethernet speed—without rewiring! The Solo 10G PCIe Card supports the NBASE-T standard of 2.5/5 Gb link speeds over CAT 5e (or better) cabling when used with a Multi-Gigabit switch or router. This capability allows you to deploy the same card across an organization for users supported by different Ethernet cabling infrastructures. The Solo 10G PCIe Card’s high throughput performance and low host-CPU utilization are attained through functions such as flow control, 64-bit address support for systems using more than 4GB of physical memory; and stateless offloads such as TCP, UDP and IPv4 checksum offloading. These processes enable your computer to perform better while large files transfers or high I/O operations take place. How simple? Install the Solo 10G PCIe Card in your computer or Thunderbolt expansion system, connect to the network switch or directly to 10GbE-enabled storage, and configure the card’s settings through operating system network device configuration tools. Audio Video Bridging (IEEE 802.1Qav, AVB) support makes the Solo 10G card perfect for use in pro audio and video applications where synchronization of data streams is critical. The Solo 10G PCIe Card is packaged with both full-height and low-profile mounting brackets, enabling installation of the card into any PCIe slot. Got a Thunderbolt connection, but no PCIe slot? 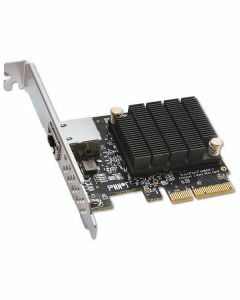 Solo10G PCIe Card is ideal for use in one of Sonnet’s Echo Express or xMac Thunderbolt-to-PCIe card multi-slot expansion systems—the combo enables you to add an ultra-fast 10GbE network connection to any Mac with Thunderbolt 2 or Thunderbolt 3 ports, or Windows PC with Thunderbolt 3 ports. You may also want to consider Sonnet’s Solo 10G Thunderbolt 3 Edition adapter—it’s compact, rugged, and bus-powered, and perfect for use with Mac and Windows computers with Thunderbolt 3. Have a multi-slot Thunderbolt 2 or Thunderbolt 3 to PCIe card expansion chassis with an open slot? Installing a Solo 10G PCIe Card is an excellent way to inexpensively add 10GbE connectivity to your computer. 1) 2.5G/5G speeds are supported when used with NBASE-T compatible (multi-Gigabit) switches. 2) Switch/router must support AVB to support this feature.